During the month of December, Milton was trying really, really hard to be on the "Nice" list for Santa. Jeff and I thought he was giving it some valiant effort which is why we bundled up all his Christmas presents, along with his stocking, and sent him off to his grandparents' house. We did not anticipate any problems. Yesterday we received a report that Milton has been quite obstinate - tugging on his walks, refusing to walk, and insistently pestering people to play tug-of-war. I just want to remind Milton of this little picture that we took a week prior to Christmas. 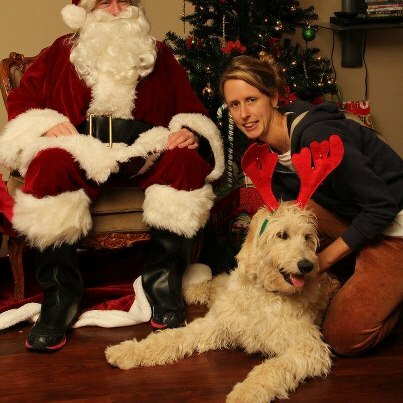 Our goldendoodle might not realize this, but Santa Claus has already begun watching for Christmas 2013. Milt needs to stay on his best behavior all year long and not just ramp it up after Thanksgiving. Likewise, if you can tell from this photograph, Santa and Milton are not the bestest of buddies. After I hauled Milton up into Santa's lap, Milt tried to crawl off over Santa's shoulder, subsequently yanking down Santa's beard and glasses, which was traumatizing for all the other young puppies waiting to sit on the big man's lap. That's why his Momma, in her sweatpants, is in the picture holding him and half of Santa's head is cut off. As we all know, a lot of a dog's "problems" stem from his owners. Since we are approaching 2013 and leaving 2012 behind us, one big New Year's resolution looming over us is: Train Milton! Hopefully that resolution will be accomplished in 2013 and will not be shifted over into 2014 like a few others of mine will be...! Our boy needs us, so we must rise to the occasion. See........Stan's problems most likely stem from mine. My motto this year is "GHEESH MARNIE, could you be a little nicer?????" Poor, poor Stanlee.